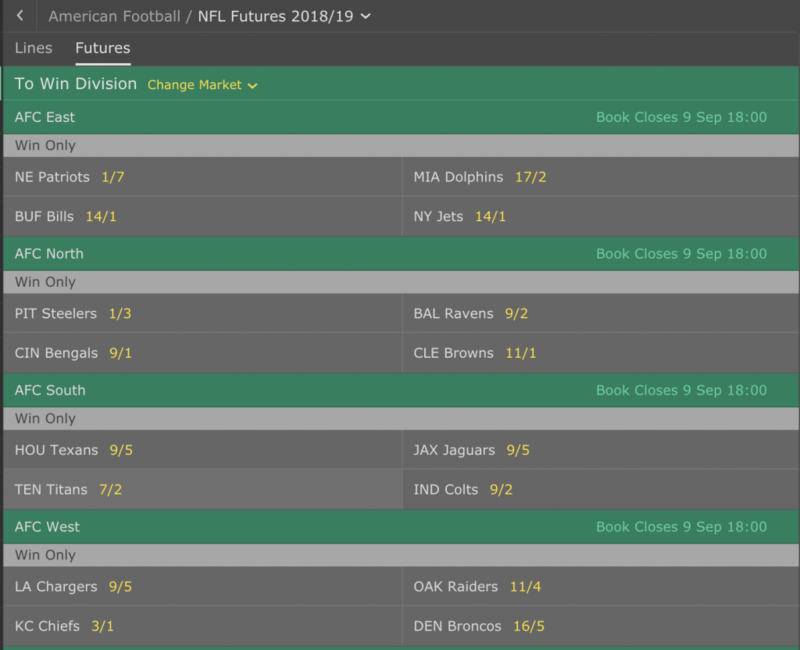 Who Wins Each of the Eight NFL Divisional Titles In 2018? We are already halfway through the NFL’s pre-season period with all the teams having played a couple of warm up games to get themselves match-ready for the start of the NFL season on September 7th when the current Superbowl Champions the Philadelphia Eagles will take on the losing finalists of the 2016 Superbowl, the Atlanta Falcons in Georgia. What will then follow is 17 weeks of intense football activity with teams given just one weekend off (their allotted bye week) across the 16-game regular season. At this point 10 of the 16 teams in each of the two conferences (AFC and NFC) will see their season come to an end. The other six teams will then play through the Playoffs to decide which team is the AFC Champion and who is the NFC Champion. 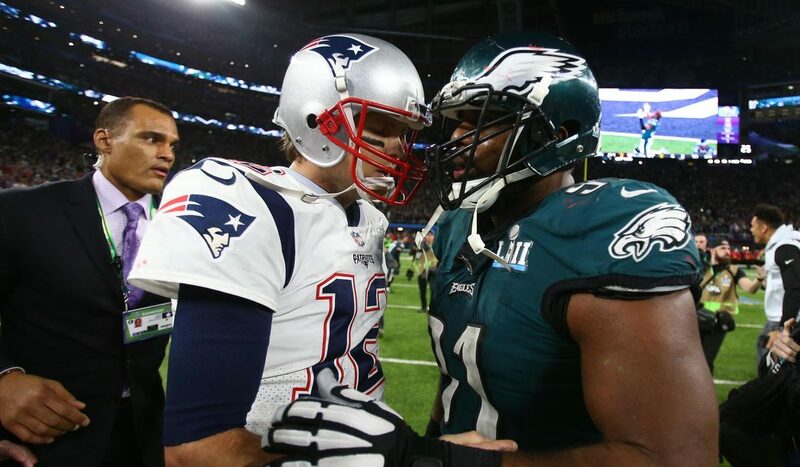 These two conference champions then head back to Atlanta Georgia, where the season will begin, to face off in Superbowl LIII and a chance to succeed the Philadelphia Eagles as the new Superbowl trophy winners. 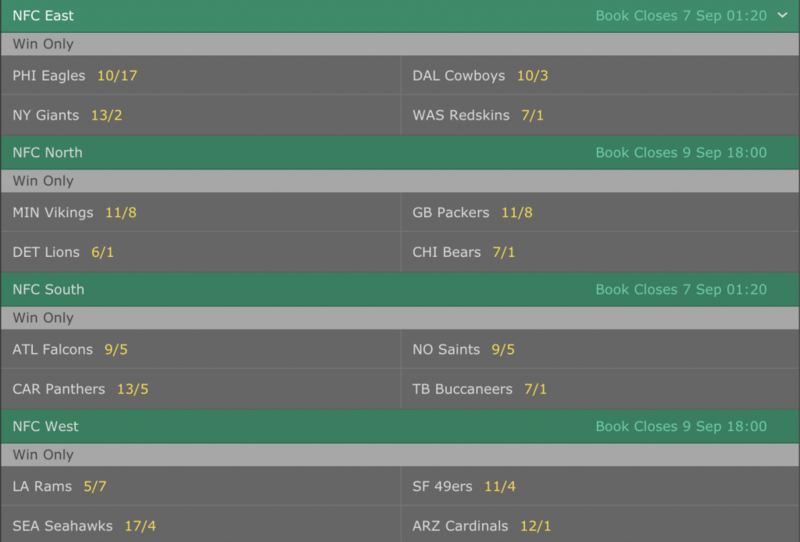 However, before the drama of the playoffs unfolds, we have the eight divisional titles to be decided. Let’s now take a look at each of the four divisions in each conference with a look at who we think will win each. *Odds correct with Bet365 at time of writing at 2.00pm on Tuesday 21st August 2018. Last season’s Superbowl winners the Philadelphia Eagles should once again claim the NFC East in what is always a tough division. However I think they will find it tougher this season. 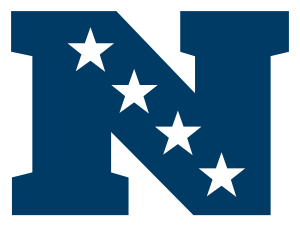 The Dallas Cowboys and New York Giants should be much more competitive and I think even the Redskins will improve, although I don’t see them challenging the top three teams in the group. This could be close but I think the Eagles will reach the playoffs once again. Minnesota Vikings and the Green Bay Packers will lead the fight for first in the NFC North. Chicago Bears have improved on last season’s dismal showing with some solid moves in Free Agency and during the NFL Draft but I feel Detroit have stagnated a little and will likely fall further behind the top two. Green Bay’s reliance on Aaron Rogers worries me and I think that is the deciding factor in why I think the Vikings will once again take top spot in this division. The NFC South is a very evenly contested division and you can make a case for any of the four teams winning it. I think Tampa will be much improved on previous seasons and could even push for a Wild Card spot, I also feel the Panthers will be better this year, though I feel Atlanta’s best chance of Superbowl glory has gone. That leaves the consistent New Orleans Saints who under Sean Payton and Drew Brees have perennial contenders in the South and I think they’ll be the team to beat here. The Los Angeles Rams should dominate this division this season. They won the division last season with a young team very comfortably and I think they have improved a lot since then. In contrast their main rivals Seattle and Arizona have failed to really halt a slow decline and while I expect the San Francisco 49ers to improve after a woeful few years, none of the other three teams are anywhere near as dynamic or as exciting as the Rams. In every season since 2001, bar two, the New England Patriots have won the AFC East and won it usually handsomely. I see no reason for that to change here as Bill Belicheck and Tom Brady will team up again to likely win all their divisional games and finish with a strong record to likely claim home field advantage (again) in the playoffs. Of the rest, I think the Bills will be in with a chance of a Wild Card spot, while the Jets and Dophins I would expect to be amongst the also-rans in the AFC. The Pittsburgh Steelers have dominated this division in recent years and I can see them doing so again in 2018 with Baltimore on the slide and the Bengals as inconsistent as ever, I see no real threat to the Steelers winning the North once again. I think the surprise in this division will be the Browns who after several dreadful seasons, should at least be competitive again after a strong showing in the draft and Free Agency has seen them strengthen their team greatly. 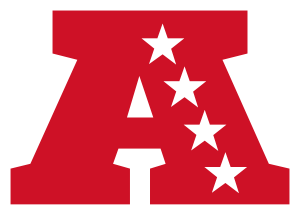 The AFC South was a joke division for several years, but recently things have improved with both Houston and Jacksonville rated as serious prospects for the Superbowl, while the Tennesee Titans have continued to improve after a strong pre-season. I think the Colts, even with Andrew Luck back from injury will struggle once again in this division and I think the Titans will land a decent record but still finish third. It will be tight between the Texans and Jaguars and I think Jacksonville Jaguars excellent defence could be the key to them winning this division. I think the AFC West is the weakest of the AFC divisions in terms of the four teams overall strength but it is also one of the most even with little between any of the four franchises. I think the Oakland Raiders will just about land the divisional title, but it will be close between them and Kansas City and the Chargers, with the Denver Broncos likely being the team that finishes bottom of the group. However, the margins between the teams are so small that this is arguably the toughest of all eight divisions to call.